If you love blue cheese like I do, you’ll love this simple Mason jar salad with pears, toasted pecans, and pomegranate seeds. Blue cheese is so flavorful that a little bit goes a long way, so you can have a rich treat without derailing your healthy eating plan. I chose a creamy buttermilk cheese for its mild, sweet flavor, but any blue cheese (or feta) will work. Fresh pomegranate seeds (also called arils) were not available at my grocery store, so I used frozen and they are just as delicious. Pomegranate seeds can also be substituted with dried cranberries. 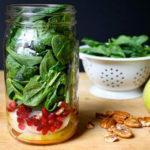 Pears are delicious in salads, but for use in a Mason jar salad like this, that might stay in your fridge for a couple of days before you eat it, it’s essential to soak the pear slices in salt water to prevent browning. This step will keep them fresh until you’re ready to dig into this yummy salad. Pro tip: To toast pecans, place a pan over medium heat and add pecans. Stir constantly to avoid burning until the nuts start to smell wonderful and turn golden brown. 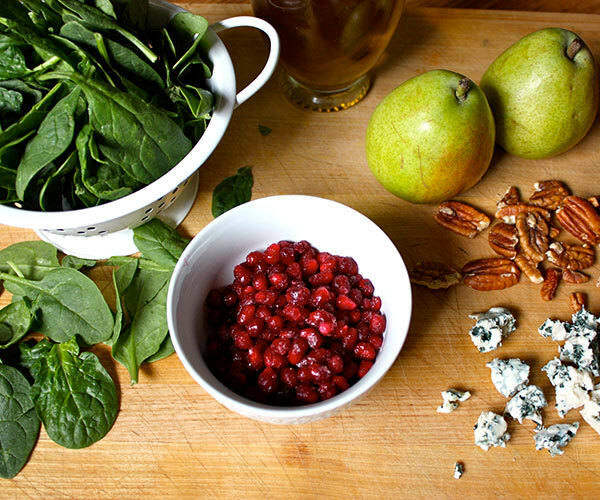 This pear and blue cheese salad features sweet and savory flavors. Combine water and ¼ tsp. salt in a medium bowl; mix to dissolve salt. Submerge pear slices in water. Let sit for 5 minutes; drain water. Set aside. While pear is sitting, combine vinegar, oil, remaining ¼ tsp. salt, and pepper in a small bowl; whisk to blend. Evenly divide dressing between 4 one-quart Mason jars. Set aside. 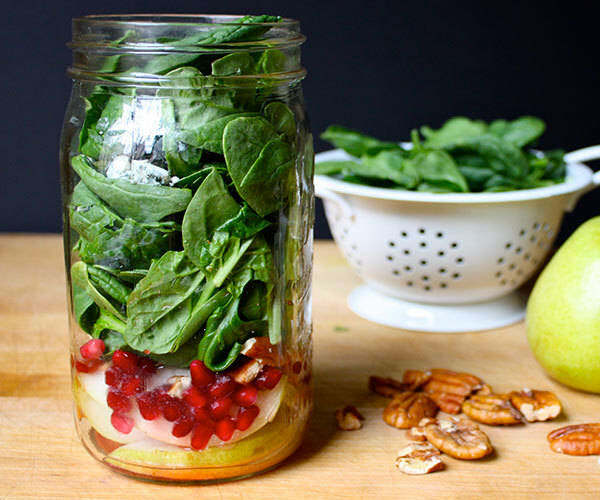 Evenly layer pears, pomegranate, pecans, spinach, and blue cheese on top of dressing in jars. Serve immediately or cover and refrigerate for up to 2 days. Shake before serving. Enjoy as part of lunch.